We invite all visitors to enter the competitions and giveaways sponsored by our suppliers. Some will run for as little as a single day, some will run for weeks, but all of them will end in happy winners. All of the competitions are bound by the General Terms and Conditions, but some may carry extra T&C's that are specific to that promotion. Be sure to read them BEFORE you enter, as no exceptions will be made and repeated violation of the terms may see you banned from entering any future competitions. Please enjoy these small offerings of joy, and we look forward to seeing you wandering around our site more often. You may also wish to keep in mind that if you are a registered member of the site, and are logged in when you enter these comps, you will automatically be issued bonus entries based on your level of membership! PLUS... If you have posted reviews and/or listed new products, you'll get even more! We like to reward our membership for the amount of effort they put in. We are very pleased to announce that in partnership with Warner Bros Entertainment we have 10 'The Lego Move 2 - The Second Part' prize packs to be won. If you want to win one of these great prize packs, click here to enter! We are very pleased to announce that in partnership with "Say what..." eMagazine and MacMillan Publishers Ltd we have 3 'eZine Exclusive - The Spanish Promise by Karen Swan' prize packs to be won. We are very pleased to announce that in partnership with "Say what..." eMagazine and Universal Pictures NZ we have 3 'eZine Exclusive - "How to Train Your Dragon 3 - The Hidden World" on DVD' prize packs to be won. We are very pleased to announce that in partnership with "Say what..." eMagazine and Universal Pictures NZ we have 3 'eZine Exclusive - "Bumblebee" on DVD' prize packs to be won. We are very pleased to announce that in partnership with "Say what..." eMagazine and VREX Hamilton we have a 'eZine Exclusive - A 30min VR Gaming Session for Two' prize pack to be won. If you want to win this great prize pack, click here to enter! We are very pleased to announce that in partnership with "Say what..." eMagazine and Barkers of Geraldine we have 3 'eZine Exclusive - Barkers Creamy Coconut & NZ Lime Dressing' prize packs to be won. Entries for this competition have now closed. The winners will be published once prize processing is complete. Watch our Twitter or Facebook pages for notice of more giveaways as they come around! The winners will be published in the next issue of the "Say what..." downloadable eMagazine. Ingredients are: Beeswax, Olive Oil, Peppermint Essential Oil and Eucalyptus Oil. 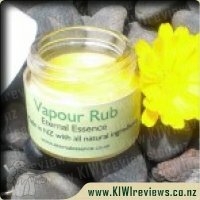 Rub on chest and anywhere else as often as needed. Safe to use on all ages.